More, more and even more additions are now available to the Green Arc Studios excellent WebFMC, that allows you use the pop-out FMC in any computer, tablet or gadget that runs an internet browser. This is version v1.3.0 and the additions this time are the trio of SSG (Supercritical Simulations Group) E-Jets Evolution Series (E-170/E-195) and their Boeing 748i Series.... and the FlightFactor A350 XWB Advanced (old style MCDU). E-Jet Evolution Series E-170/E-195 v1.3 by Supercritical Simulations Group is a great addition to the WebFMC portfolio. These FMS units are from Javier Cortes (FJCC) and not directly from SSG, Javier's FMS units have been around for years and notably in the x737 installation... Note the layout is exactly the same in either aircraft. 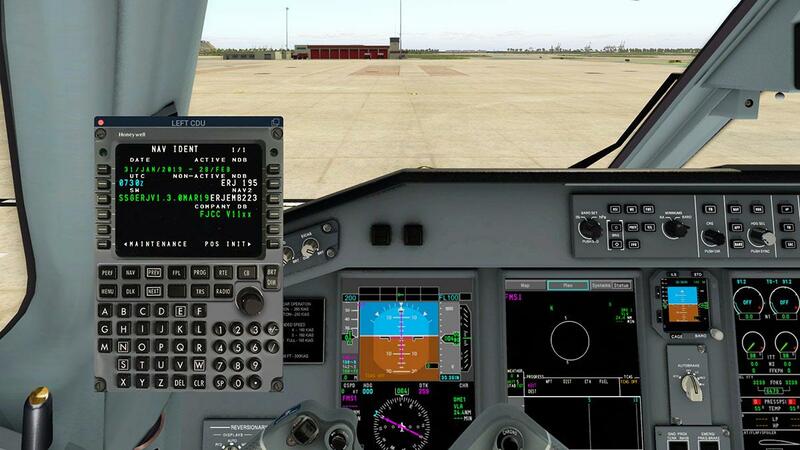 The latest E-Jet Series version 1.3 is required to use WebFMC. The computer based WebFMC is shown on the right and the internal FMS is shown on the left, the Chrome browser is the recommended browser for WebFMC Pro. 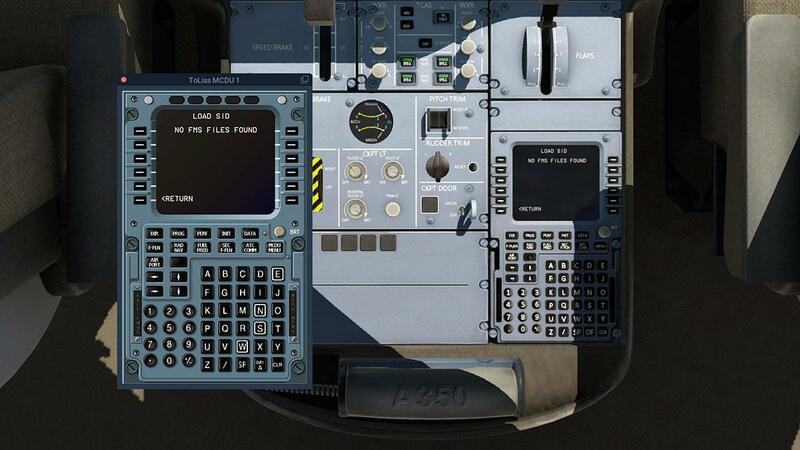 Again the facia FMS plate is a replica of the original Honeywell unit, although with a shorter facia on the WebFMC version, it is also the correct facia plate on the E-Jet aircraft, and it can be set in "Dirty" or "Clean" modes. I personally use the WebFMC to set out the route and input the performance data. So I use SimBrief (Route Creation) and Navigraph (Charts) to build up the routes. 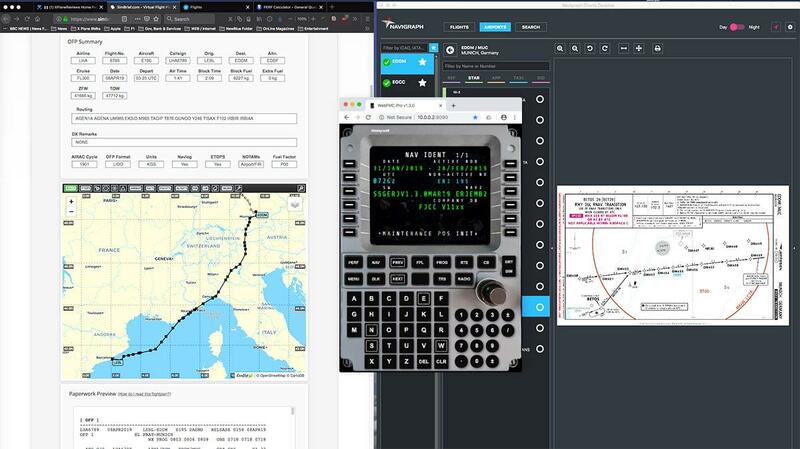 By using the WebFMC as you can see I can have all the route information and chart information ready at hand for input and direct keyboard access for inputting data and route info. Yes you can do the same within the cockpit with the popup... but you will also be turning your head consistently to gather the info on another (computer) screen, I find this system far quicker in creating the flight data. The Boeing 748i Series latest update is not yet available (I will add it in here when it is) so I can't yet show that particular WebFMC Pro installation. The installation in the FlightFactor A350 XWB is a bit different to the usual in the aircraft facia to WebFMC facia installation. 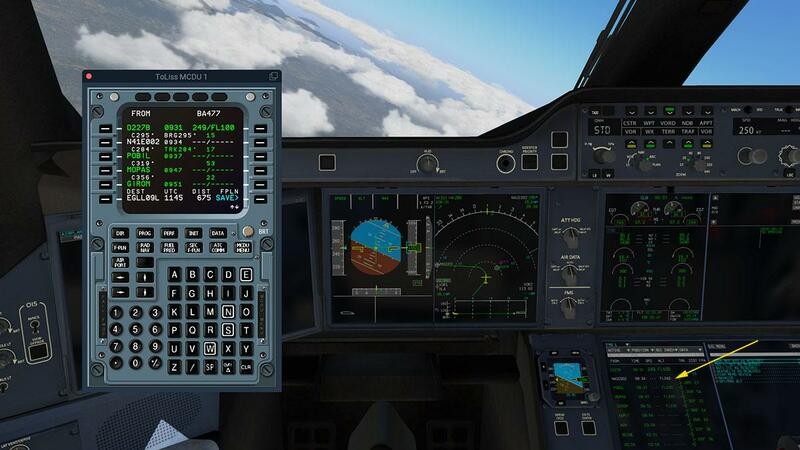 FlightFactor's Version v1.5.1 is again required to use WebFMC Pro. The facia layout in the FlightFactor A350 is not the front MFD (Multi-Functional Display) FMS, but the rear pedestal unit and pop-up panel.... as WebFMC Pro uses the ToLiSS A319 facia panel (and pop-out) for the input of route data and performance details. A lot of the data is reflected in the MFD version, but a lot is not. To the diehards then such a difference in authenticity may grind a little, but there are currently several reasons for this. One the current MFD A350 FMS is not the full monty anyway, as it is hybrid FMS system that combines several different elements to replicate the actual A350 FMS and MCDU. 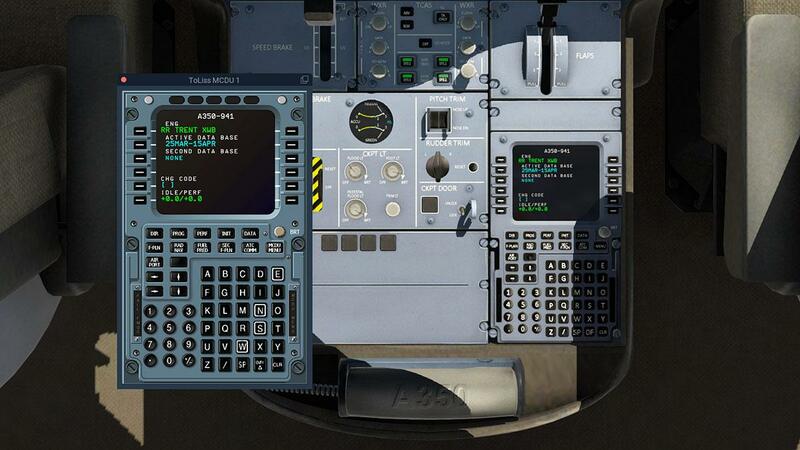 As we shall see in that using the A319 layout you can input more data and more easier than the hybrid version. Secondly the rumors are swarming around that the next A350 XWB XP11 will have a full and complete "Study" system of the A350 FMS? 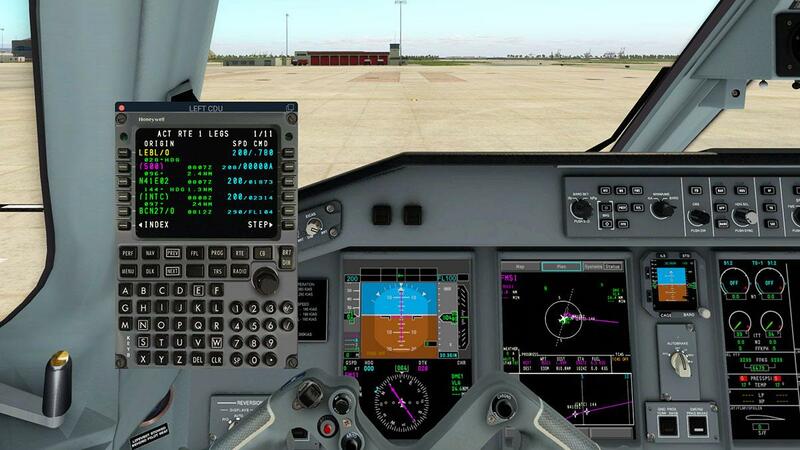 Green Arc Studios have noted that if such a system is created then the WebFMC version will follow the study grade pathway... in other words this A 319 panel version is just a temporary solution to the several problematic areas of the A350 FMS. 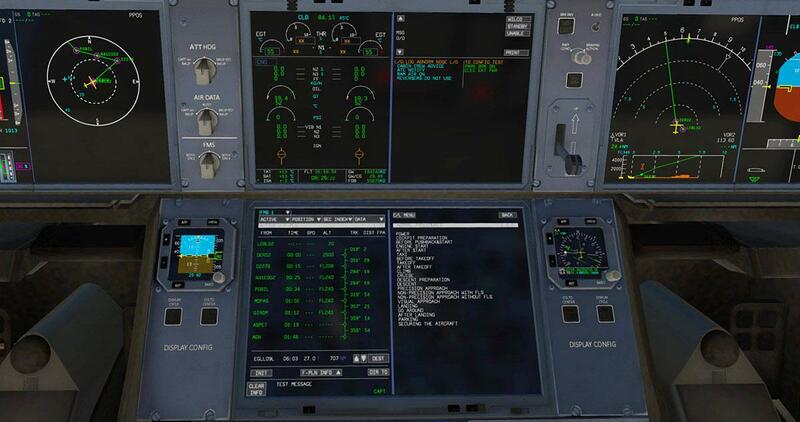 If you know your way around the A319 FMS then this will come as breeze to to do but the systems are not perfectly in alignment. The MFD A350 version was always a bit complex in what areas (boxes) to fill in or not or which were the active segments? This version is still also problematic compared with the A319 as well as you can't use SID/STARs either when building up a flightplan? Annoying well yes, certainly for a commercial service airliner of this category. 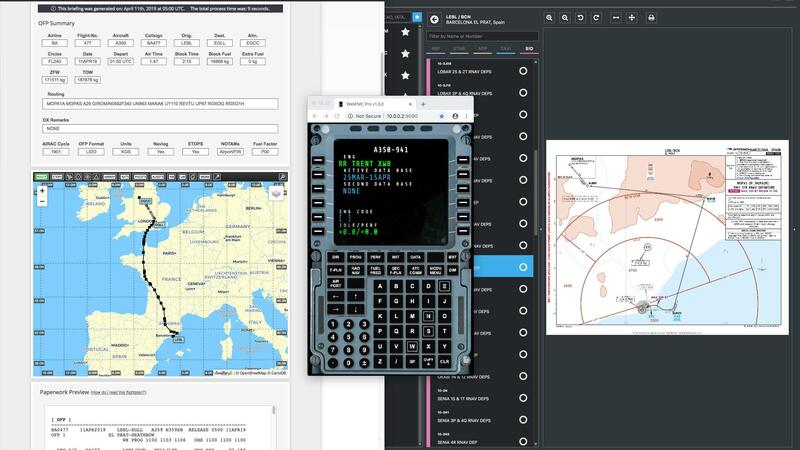 .... at least you do get access to the SID and STAR routing, for which here at LEBL (Barcelona) the departure RWY 02 SID to MOPAS (MOPA1A) is quite complex... note to add in the DEP runway and ARR runway directly into the WebFMC Pro as it is required and not included in the .FMS flightplan noted here is the DEP runway of 02. Loading in or laying out the flightplan is far easier with the WebFMC Pro, but there is the point to be made in that unlike usually in using the WebFMC in that it not always mirrors the changes on the internal aircraft FMS, With the A350 setup you have to select the same page to see the information installed. ... or inputting or building the route then WebFMC works fine and is actually an advantage. 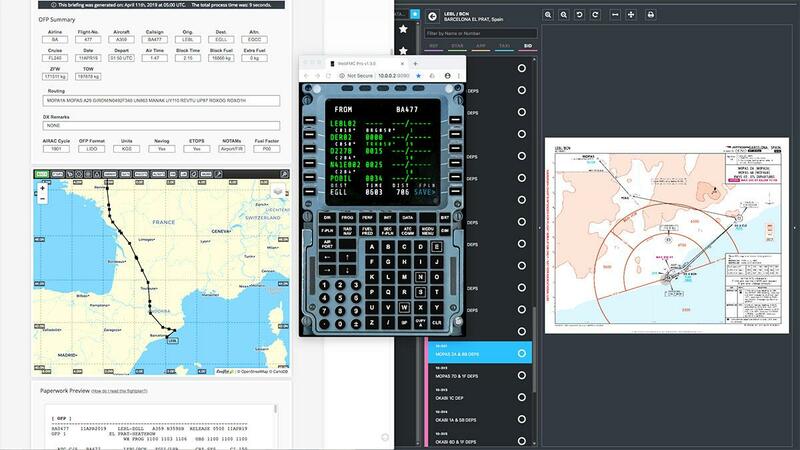 But for other settings like PERF (Performance) T/O - CLB (Climb) - CRZ (Cruise) - DES (Descent) and APPR (Approach) then some areas co-ordinate but a lot of areas don't, so you have to fill in both WebFMC and the onboard FMS... This is not really a WebFMC issue as the FlightFactor's own A350 XWB system is not only confusing, but differential in the fact of what you input in on the OIS - On-Board Information System then is generally not reflected or accepted on the FMS either? Inputting SimBrief route and weight data is not also comparative either like with passenger load and fuel loads are either over estimates or not exact in numbers to do a comparative flight to the SimBrief flight plan.... it is all very messy. In flight the system works well... 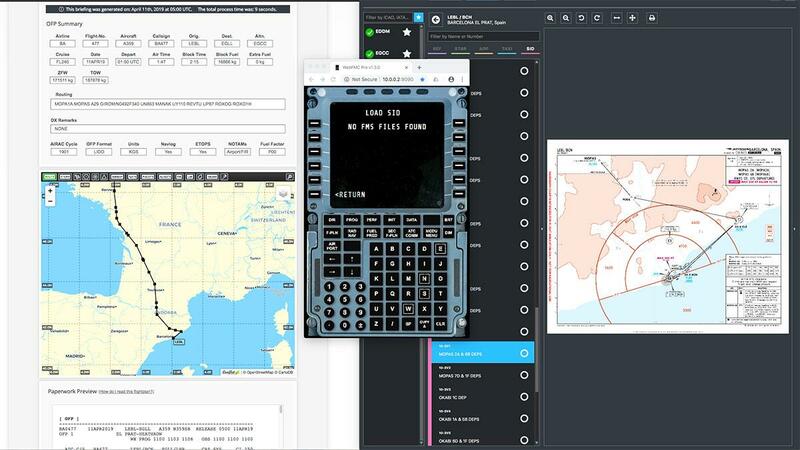 Following the flight plan and SID charts can be done with the WebFMC, while the ToLiSS pop-up mirror can be used in the cockpit, all flightplan date is also reflected on the MFD flightplan and data (arrowed left). Enroute I like all the route data handy and WebFMC is very good here in following the route data via SimBrief and Navigraph Charts. 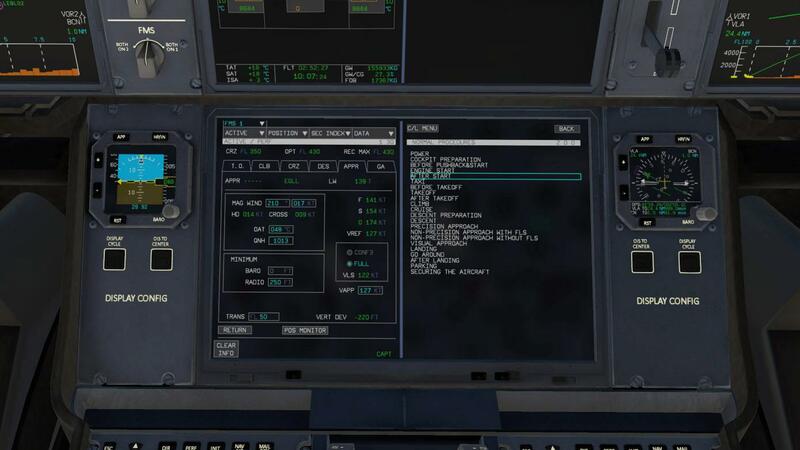 In simulation today you have a huge amount of data available to you (admittedly at a cost of subscriptions), but the detail helps and makes even the FlightFactor A350 as compromised it is in it's current form still a worthy simulation. This is another update to the excellent WebFMC Pro, this is a plugin that can be used in a browser on another computer or a tablet. 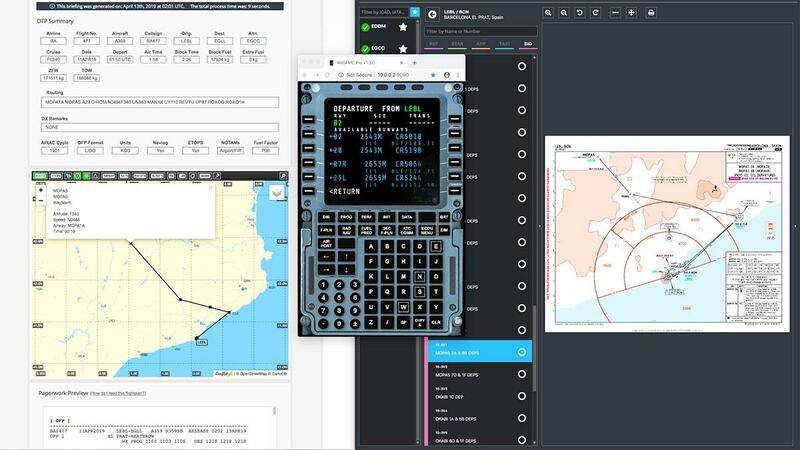 It is a remote tool, but a very beneficial and even a powerful one in programming in route and performance data and following the set aircraft route in flight in mirroring the aircraft's built in FMS (Flight Management System). 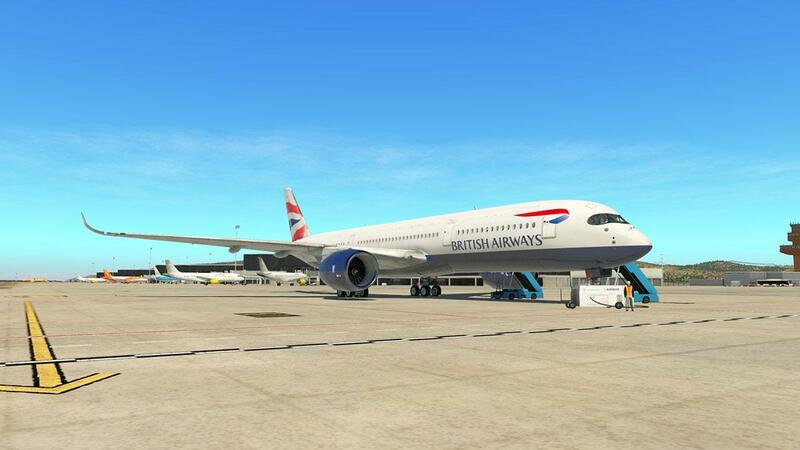 This update adds in more aircraft FMS's to cover the Supercritical Simulations Group (SSG) E-Jets Evolution Series (E-170/E-195) and their Boeing 748 Series and the FlightFactor A350 XWB Advanced (old style MCDU). 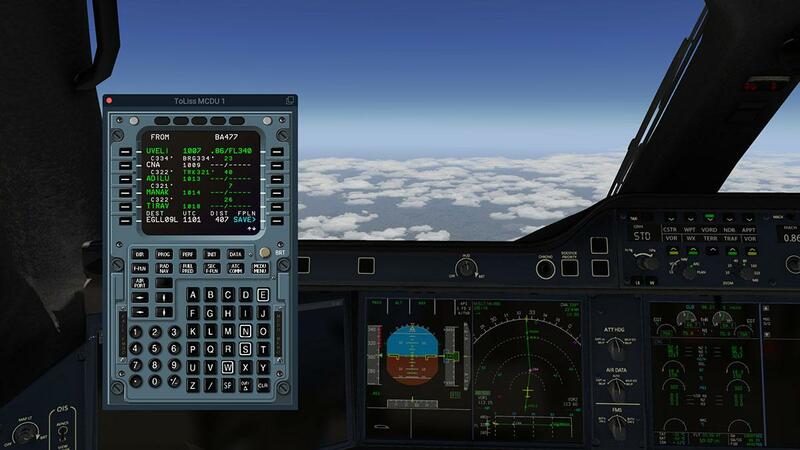 The WebFMC Pro FMS list available is now listed as 14, but two in the list of the Zibo Mod 737-800 and the 737-900ER Ultimate are also available in the Free Demo version. 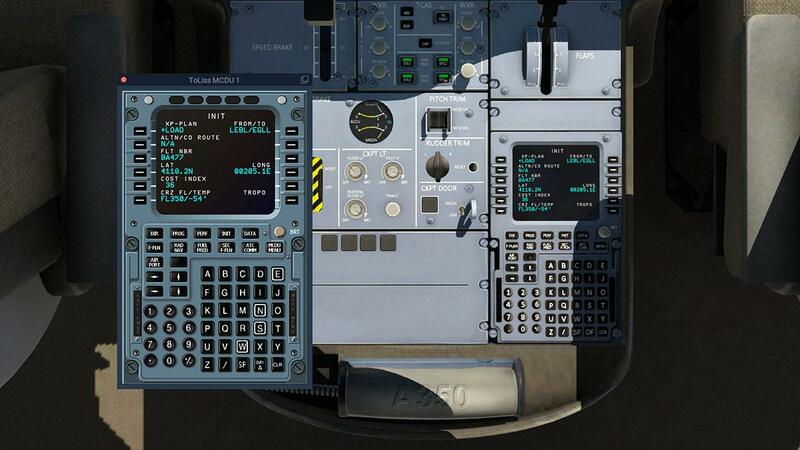 All WebFMC Pro facias work very well and are mostly authentic to the real aircraft's facia plates, but the FlightFactor's A350 XWB layout is slightly more complicated and not as study grade as most of the other units here, so currently it uses the ToLiSS FMS system to do the work, that FMS is a situated on the aircraft's rear pedestal. 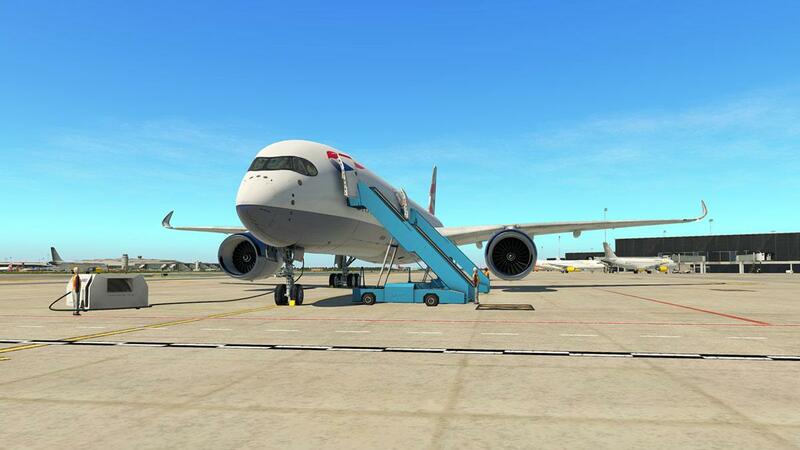 The v1.3.0 update is free to previous purchasers of the plugin, go to your X-Plane.OrgStore account for the new version. 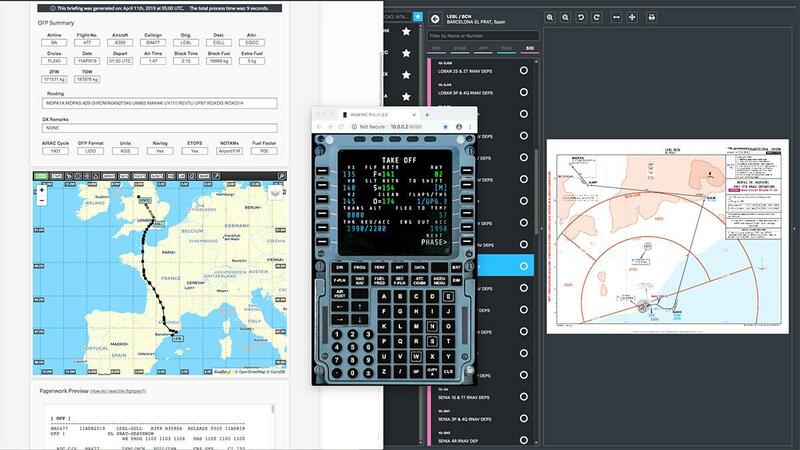 Get easy access to the FMC: quickly edit the flightplan, monitor flight progress, set up your approach and do all the typical work of the pilot without having to move around in the cockpit, even if the plane doesn’t support FMC as a popup natively - on the same PC, or different monitor, tablet or phone - in fact you can use multiple displays at the same time! 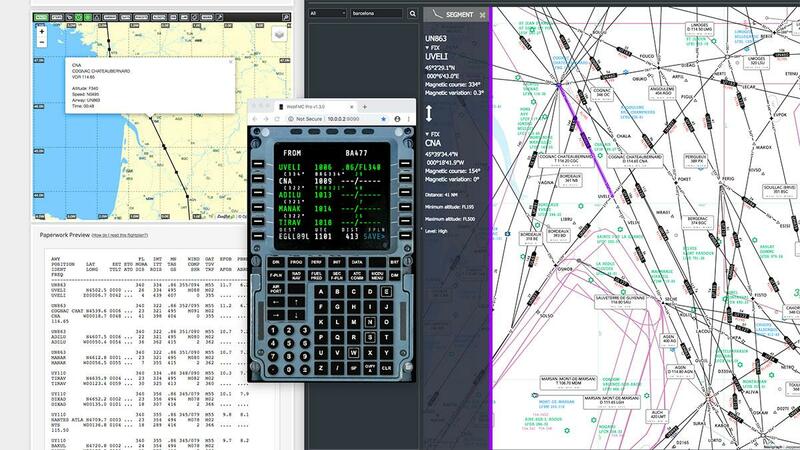 Enjoy external views during cruise while monitoring flight progress on separate screen or take a quick look at your phone to verify calculated landing speed with just a glimpse of an eye during busy time on approach. 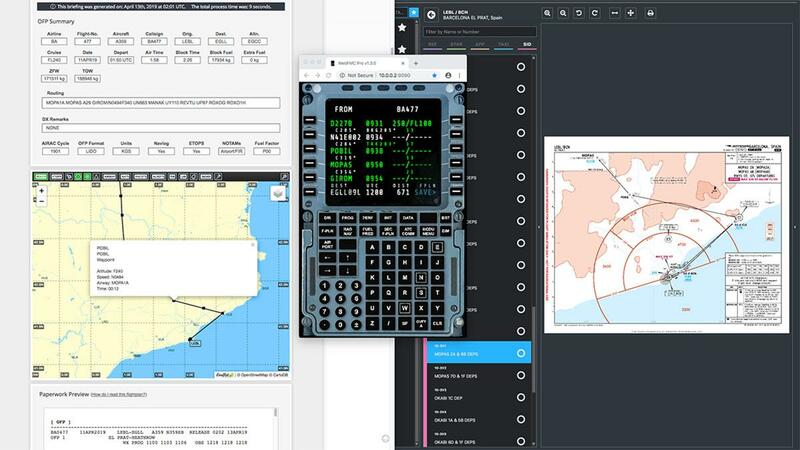 Make flying complex SIDs / STARs easy as you can focus on the important flight parameters while having overview of the constraints all the time. Take your mobile to the kitchen as you cook a dinner during a long haul and never miss T/D again! Use physical keyboards on PC with extra keys such as Prev/Next page mapped to keyboard keys for easy access. WebFMC scales dynamically to fit any display or window size and can look as native app on mobiles by using browser's "Add to home screen" feature. We recommend the latest versions of Google Chrome on PC or Android and Safari on iOS. No internet connection required, remote device needs to be on the same local network as X-Plane PC. Support for WebSockets RFC 6455 standard is required which implies at least iOS version 6.